MARINE CITY—A main character in hiding, pretending to be someone he or she is not, is the basis for many a comedy. The concept can be spun in a myriad of ways, and rarely feels worn out if done well. In the right hands, the “character in disguise” storyline can result in fabulously successful comedy. Sister Act, a musical based on the motion picture, is one of those successes. Currently playing at The Riverbank Theatre in Marine City, Sister Act (directed by Brittany Smith) features comedic situations, interesting characters, and enough hijinks to make you laugh out loud. This production is made even better with incredibly fun music and impressive vocal performances throughout. Sister Act is the story of Delores Van Cartier (played by Anita Newby), a glitzy wanna-be performer trying to get her big break as a lounge singer. But when she witnesses her sleazy boyfriend kill one of his own underlings, she is forced to hide out until she can be a witness at his trial. 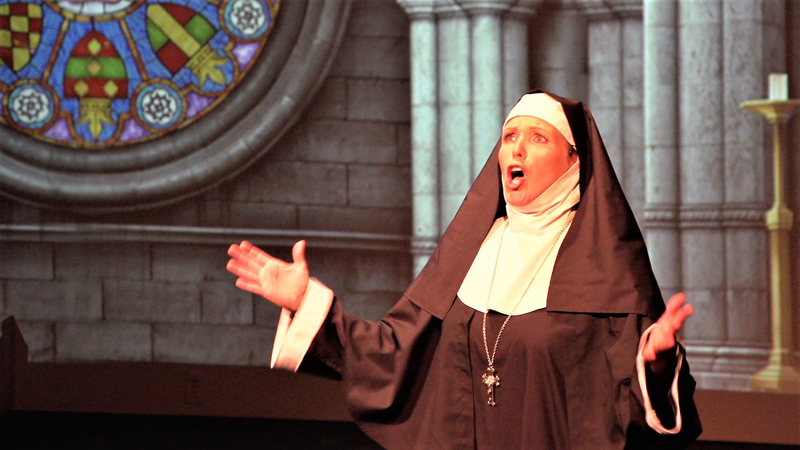 The Mother Superior at the local convent (played by Katherine Guc) agrees, reluctantly, to take her in temporarily and disguise her as a nun. The other nuns accept her, but Delores fits in with them about as well as one would expect for an irreverent spotlight hog among modest and humble servants of the church. But Delores soon finds a niche when she realizes the convent choir desperately needs some musical leadership. The Monsignor and Mother Superior are impressed with the progress of the choir, and the groovy new sound of the convent choir becomes the talk of the town, driving up church attendance and financial offerings. But things get out of hand as the soul-singing nuns are catapulted to superstardom, and Mother Superior prays for a solution to her “Delores problem” even as Delores’ cover is blown. Delores easily identifies her true friends, though, when they are all faced with danger from her murderous boyfriend. This performance is full of fun from opening to closing curtain. First, Sister Act features music by Alan Menken, which means viewers are treated to a show full of creative, exciting, and catchy tunes. Secondly, thanks to lyricist Glenn Slater, the songs are not only very relative to the story, they do quite a bit of the narrative heavy lifting, revealing important parts of the story that are not told in dialogue and making them an indispensable part of show, not simply a musical add-in. The musical success is highlighted by very strong vocal performances from the cast, notably Newby as Delores, Guc as Mother Superior, Katy Nelson as Sister Mary Robert, Colleen Wood-Ellery as Sister Mary Patrick, Chase LePla as Eddie and Xavier Bush as TJ. Add to that some high-energy choreography (also by Smith), and songs like “Raise Your Voice” and “Sunday Morning Fever” are truly unforgettable. Other numbers, such as “It’s Good To Be a Nun,” “I Could Be That Guy,” “When I Find My Baby” and “Lady In The Long Black Dress” show the humorous side of the cast as well. Music Director Aaron Dennis Smith has created an ensemble that really gels. Aside from the music, the cast is adept at humorous delivery, expression and timing. On the technical side, it should be mentioned that the sound balance (Dan Wolking) between music and vocals was, refreshingly, just about perfect, and the orchestra was great. This show will entertain audiences from teen on up (note: there are a handful of four-letter words sprinkled throughout, and a character is shot—bloodlessly—on stage), especially those who love rousing musical numbers, humor, and a few sequined costumes to top it all off. Sister Act is playing at the Riverbank Theatre in Marine City through July 23, 2017.